Google Future Classroom solutions /Google future Classroom Programme in TS Schools for 2018-2019: Google's Classroom is a free service for schools, non-profits, and anyone with a personal Google account. Classroom makes it easy for learners and instructors to connect - inside and outside of schools. Classroom saves time and paper, and makes it easy to create classes, distribute assignments, communicate, and stay organized. 1. Easy to set up – Teachers can add students directly or share a code with their class to join. It takes just minutes to set up. 2. Saves time – The simple, paperless assignment workflow allows teachers to create, review and mark assignments quickly, all in one place. 3. Improves organization – Students can see all of their assignments on an assignments page, and all class materials (e.g., documents, photos, and videos) are automatically filed into folders in Google Drive. 4. Enhances communication – Classroom allows teachers to send announcements and start class discussions instantly. Students can share resources with each other or provide answers to questions on the stream. 5. Affordable and secure – Like the rest of G Suite for Education services, Classroom contains no ads, never uses your content or student data for advertising purposes, and is free. Google Future Classroom to provide holistic education in TS Schools: Google Future Classroom solutions to be adopted by the DSE to provide holistic education to its TS School students. It is to transform conventional classrooms by empowering teachers to integrate digital tools and aids seamlessly in their teaching process and its is to accelerate learning for students and encourage creativity and critical thinking. The solution is in line with the Smart Education/Smart Classroom mission to create internet-connected, future-ready classrooms. The future classroom lab setup blends the needs of a digital classroom through the use of K-Yan, an integrated computer projector and personalized learning through the use of Chrome-books for each student. Under the partnership, the schools will be provided Chromebooks with GSuite for Education. The content on the Chrome-books will be available in both English and Telugu. 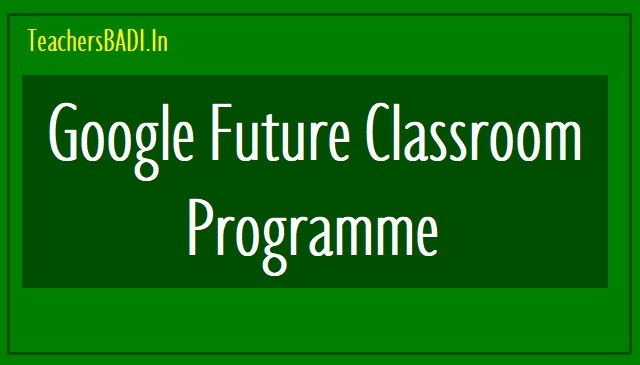 Sub: RMSA,TS, Hyderabad - Google future Classrooms -Teacher work shop at Google, Hyderabad - Interaction with HMs/ Principals of Secondary Schools at Googles Office Hi-Tech City on 27th April 2018 at 10.00 AM - Reg. The DEOs are directed to depute the HMs / Principals / Special Officers of thc schools along with One computer operator as per the list encloscd to the meeting on 27.O4.20lB at l0.00 AN at Google Office, H-tech City, Hydcrabad, en route from Shilparamam to Kothagudem 'X'roads. Google Classroom: Google Classroom is a free web service developed by Google for schools that aims to simplify creating, distributing and grading assignments in a paperless way. The primary purpose of Google Classroom is to streamline the process of sharing files between teachers and students. It was introduced as a feature of G Suite for Education, formerly Google Apps for Education. Google announced a Classroom API and a share button for websites, allowing school administrators and developers to further engage with Google Classroom. In March 2017, Google opened Classroom to allow any personal Google users to join classes without the requirement of having a G Suite for Education account, and in April, it became possible for any personal Google user to create and teach a class. Google Classroom combines Google Drive for assignment creation and distribution, Google Docs, Sheets and Slides for writing, Gmail for communication, and Google Calendar for scheduling. Students can be invited to join a class through a private code, or be automatically imported from a school domain. Each class creates a separate folder in the respective user's Drive, where the student can submit work to be a graded by a teacher. Mobile apps, available for iOS and Android devices, let users take photos and attach to assignments, share files from other apps, and access information offline. Teachers can monitor the progress for each student, and after being graded, teachers can return work, with comments.